"Besides me nobody is alive who joined the UCIL as mill worker in the 1960s," says Saluka Himbram, the village head who retired from UCIL after 34 years of employment. "Abnormal births have become common. Half of the village's women have problems in delivery and miscarriages." Two years ago, residents were told not to drink water from the three tube wells. Life becomes hell in summer. "We feel like vomiting when the wind, carrying fine dust from the pond, reaches us," he says. His son, who is now working as a miner, has already made 39 visits to a doctor in the last six months. "A strange pain in his abdomen keeps him down for days," he says. "There is some problem here. The tailing pond must be causing the problem." Complaints of defective births, rising tuberculosis, and lung and abdomen cancer from villagers living around the uranium mining facilities are on the rise. "The generation born after uranium mining started is showing these symptoms more prominently," says Ghanashyam Birouli, a Jaduguda-based anti-uranium mining activist. Birouli's father, a worker in the mines, died of lung cancer. "Radiation level is high and the carelessness in disposing various wastes have overexposed us to radiation," he says. The ore is milled to separate the uranium from other ore components. Waste from the milling process poses significant health and environmental hazards. It takes more than 1000 metric tonnes of ore to get 2 metric tonnes of uranium (to obtain a typical uranium concentration of 0.2 per cent). More than 998 tonnes of waste is generated in the process. This waste, called mill tailings, contains 85 per cent of the radioactivity in the original ore along with heavy metals and chemical toxic materials. When discharged from the mill, the tailings are roughly 40 per cent solids and 60 per cent liquid. According to estimates made by M. V. Ramana of the Center for Energy and Environmental Studies at Princeton University, US, the amount of waste produced during mining and milling is 4.1 million tonnes. To obtain a purer uranium ore grade of 0.03% would increase the toxic waste to 9.3 million tonnes. A survey and scientific testing of samples from the soil and water in and around the Jaduguda mines by Hiroaki Koide of Kyoto University's Research Reactor Institute in July 2002, found high radioactivity. The permissible limit for radiation exposure by any 'artificial factor' is 1 millisievert per year (1mSv/y), or 0.11 microSv/hour. In Jaduguda, there are places where the external gamma dose by only the 'natural factor' exceeds this limit. Exposure by the 'artificial factor' is avoidable. The most pernicious source of contamination lies in tailing ponds, and here the amount of air-gamma dose exceeds 10 mSv/y (1.1 microSv/h). 1.The amount of air-gamma dose exceeds 1 mSv/y in the villages, and reaches 10 mSv/y around the tailing ponds. 2.The perimeter of the tailing ponds is polluted with uranium, from 10 to 100 times higher as compared with areas without contamination. 3.Number 1 tailing pond is contaminated by cesium. As the area's uranium mines do not produce cesium, this shows the area is used as a dumping ground for radioactive waste brought from other polluted sources. 4.Uranium concentrations are high in samples taken from the riverbank and roads. This perhaps indicates tailings are used as construction materials. 5.At the Rakha mines station, from where semi-processed uranium is sent to Hyderabad for fuel fabrication, the soil is polluted by only uranium. Its concentration is remarkably high. Another survey of four villages, two in the vicinity of Jaduguda (where a similar plant has been in operation for many years) and two villages some distance away from the plant, conducted by the Gujarat-based Sampoorna Kranti Vidyalaya Vedchhi (SKVV), found that the number of infants born with genetic disorders was six times higher than normal, due to the harmful radiation emitted by UCIL's operations for more than two decades. Of the 70 such cases reported, 60 were born with congenital deformities in villages close to the Uranium plant, whereas 10 were born in non-affected areas. Moreover, 16 out of the 60 were mentally retarded, compared to one in other areas. Cases of infants born with Polydactyl (extra fingers or toes) and synductyl (fused or missing fingers and toes) is also common in the affected areas. "By this, we can safely conclude that living in the vicinity of a Uranium mining and processing plant is an invitation to produce deformed children," says Surendra Gadekar of Vedchhi. Of the 107 Tuberculosis cases reported in the area, 50 cases alone were reported from the 591 persons working in the mines. In comparison, only 57 cases were reported from the general population of 7,051. The survey said that while the incidence of lung cancer and silicosis was high among people engaged in mining and processing of Uranium ore all over the world, not a single case was reported in Jaduguda, even though the incidence of Tuberculosis was high among the locals. "Wrong diagnosis helps the company since silicosis is a occupationally caused disease whereas Tuberculosis is not," Gadekar alleged. But UCIL and BARC have denied radioactivity in the area, and attribute the health problems to chronic malnutrition and other localised reasons. "Jaduguda has less radiation than Hyderabad," says A C Kundu, UCIL's the general manager (mines). Similarly, R K Sharma, head of BARC's public awareness wing maintains, "All our health monitoring of mine workers and other people residing the tailing pond shows no radioactivity beyond permissible levels. So the health problems are not linked to the mining activity." BARC's Health Physics Unit monitors the radioactive exposure of workers in nuclear establishments and the AERB prescribes the safe dosage of radioactivity exposure. According to its limits, the cumulative effective dose constraint for five years should not be more than 100 mSv for individual radiation workers. The annual effective dose to individual workers in any calendar year during the five-year block shall not exceed the limit of 30 mSv. A BARC survey of radiation in Jaduguda found that the background radiation level is about 1179 microGray/year (uGy/y), which is about the same level as observed in other parts of East Singhbhum district. At Jamshedpur it is 1150 uGy/y, and at Ghatsila it is 1226 uGy/y. The limits of radiation exposure for general public are 1000 uGy/y over and above the natural background radiation. This is equivalent to exposure from standing in the tailings pond for four hours, every day. 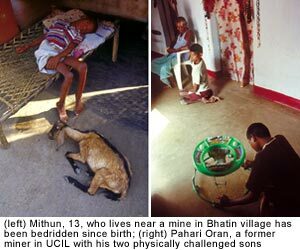 UCIL workers are sent for health check ups every five years. Only the health report is given to the worker; the radiation report is kept with UCIL. From 1964 to 1994, 22 employees have been stricken with cancer, as admitted by its former chairman & managing director J L Bhasin. The effluents discharged by the mill (where the ore is processed) are monitored regularly and the results submitted to Atomic Energy Regulatory Board (AERB) for review. The results are found to be within the prescribed limits stipulated by AERB. The Health Physics Unit also monitors the radon concentration in the tailings ponds. "Here, the concentrations are slightly above the background level. For this reason, the tailings pond is fenced and access is restricted. Away from the tailings pond, the concentration approaches the background level within 250 metres," AERB clarified in a reply to allegations by activists. About 40,000 people work in nuclear installations in India. Established in 1983, the AERB, is the nodal authority to enforce radiation safety related rules in the country. One of the functions of the AERB is to 'prescribe acceptable limits of radiation exposure to occupational workers and members of the public'. This is a very flexible procedure, and whenever the AERB feels the need to change the limits, it has to issue a notification. According to the current limit, the cumulative effective dose constraint for five years is 100 millisievert (100 mSv) for individual workers exposed to radiation. The annual effective dose to individual workers in any calendar year during the five-year block shall not exceed the limit of 30 millisievert. AERB claims that over time, there has been a gradual decrease in the number of people exposed to radiation in excess of prescribed limits. For instance in 1989, about 9 per cent of workers in nuclear power plants were exposed to radiation levels above 20 mSv/year. This gradually declined to 2.2 per cent in 1993 and 0.3 per cent in 1997. In 1998, only nine workers out of the 10,145 exceeded the 20 mSv/year radiation dosage. In medical, industrial and research applications of radiation, the number of workers exposed to 20 mSv/year and above was 0.27 per cent in 1989, which gradually declined to 0.18 per cent in 1998. The corresponding number of workers in industrial applications of radiation is 1.92 per cent in 1989 to 0.45 per cent in 1998. S K Malhotra, head of the publicity division of the Department of Atomic Energy (DAE), claims two independent surveys commissioned by the organisation, one conducted by Patna Medical College and another by a team of doctors, found radiation levels below the limit. In fact, says Malhotra, the survey results stated that the health problems were not linked to the radiation from the mines. "While the Indian Council of Medical Research (ICMR) has estimated the national average incidence of cancer to be 74 per one lakh population, in Jaduguda the incidence is only 22 per lakh population," he said. Claims, counterclaims and secrecy continue to cloud the issue. As endless convoys of trucks pass the army of handicapped children, the people of Jaduguda are trying to learn how to live with the risk, every day.